The next two metrics we need to discuss, ROAS and RPI (revenue per impression) rely on tracking revenue and often on talking about ROAS and ROI. Before we get into those metrics, we need to examine how data is passed back and forth to your PPC accounts in order to use terminology that is somewhat in line with marketing and economic terms. There is a lot of confusion about ROAS, ROI, and Google’s Conv. Value/Cost metric, we’re first going to dig into these metrics before proceeding to how to use them in your ad testing. Return on investment (ROI) has been long misused in search. The true formula for ROI is ROI = (revenue – cost) / (cost). This formula has been warped by many marketers into ROI = (revenue) / (cost) (please note that formula is not correct, we’ll cover the correct one in a moment). They choose to use this incorrect formula because ROI can be a negative number, and negative numbers make bid calculations more complex. A 100 percent ROI in the incorrect formula is your breakeven point (assuming you aren’t taking the cost of hard goods into account), so calculations become easy. The simple explanation for this is that since you are calculating marketing costs, you just removed those same costs from the formula to calculate ROI. When search marketing was primarily conducted by non-marketing people in the early years when the web designer or IT department often ran paid search, this slight change in definition often did not matter to the company. However, as search has grown into a multi billion-dollar business and is being taught in college marketing classes, an effort must be made to correct the use of these terms so that it is consistent between company departments. The ROAS formula is ROAS = (revenue / advertising cost). The ROAS formula is the same as the warped or incorrect ROI formula used by many search marketers. While this difference doesn’t matter to everyone, if you ever run into a CFO auditing your numbers, they will care quite a bit about the difference in ROI vs ROAS. Let’s take a simplistic look at the difference between ROI and ROAS. In this example, for campaign 3 to break even it needs to lower its bids by 50%. By using ROAS as our bid multiplier, its easy math to do within Excel since ROAS is always a positive number (or 0); hence why ROAS is used by most marketers to set bids. If you use ROI, since the number can be positive or negative, you need to build a more complex formula to calculate your bids. In the end, the answer is the same: reduce your bids by 50% to break even. This is why most PPC marketers actually use ROAS even if they say they are using ROI. Please note, this isn’t everyone – many people know the difference and are calculating these numbers correctly. However, at every conference I attend, at least one speaker uses the ROI term incorrectly. If you are ignoring hard costs such as salaries and manufacturing, and if you are selling a digital good – then ROAS is usually a good number to work from and your ROAS is your actual ROAS. However, if you are selling physical goods then you need to remove the cost of those goods from your revenue to calculate bids and determine ad test winners. Please note, this cost of physical goods does not always have to be physical goods. If you are selling hosting packages, then you’d want to remove your costs for servers, bandwidth, etc as they are hard costs. However, there’s not an easy way to do this in AdWords, hence why we’re going to stick to physical good examples since that can be programmatically accomplished. AdWords allows you to pass dynamic variables to your account based upon the sale. (Information on how to do that here). Most advertisers are passing along the total sale of goods (excluding shipping) to AdWords who are using this feature. In this case, ROAS is not true ROAS since the cost of goods is not being removed before the metric is calculated. This is why a lot of companies do not have a 100% break even ROAS. They might have a 200% ROAS target to break even since they have to accommodate for the cost of goods in their calculations. In these cases, the company might have a 400% ROAS target for the account to be profitable. Some companies are passing total cost of goods sold minus cost of hard goods to AdWords. In this case, ROAS really is ROAS (again, assuming you’re only talking goods and no other fixed costs). If you are calculating actual ROAS, then a 100 percent ROAS is breaking even if you have 100% margins or are removing the cost of goods before calculating the number. If you are selling products and not removing the cost of those products, then a 100% ROAS means that you are losing the cost of the product, and potentially shipping, on each sale. A 200 percent ROAS means for every dollar you spend, you bring in two dollars of revenue. A 50 percent ROAS means for every dollar you spend, you bring in only 50 cents. In other words, a 50 percent ROAS means you are losing money. This is where calculating ROAS and ROI can be even trickier as we’re making the assumption that we’re only talking about the cost of goods and marketing costs. Some companies calculate revenue and profits by taking out all costs, which can include overhead, salaries, and so forth. So even within a company you might have two different calculations for the same metrics. 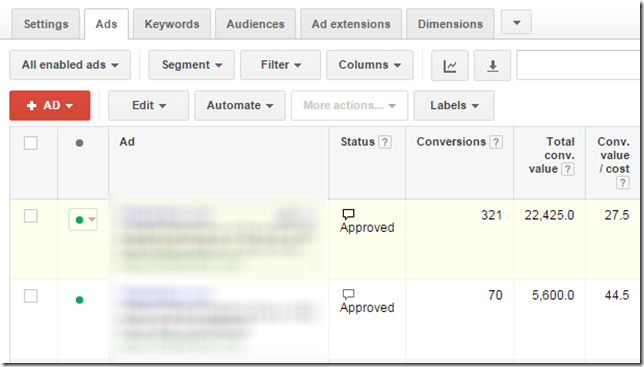 If you are passing revenue amounts into AdWords then you can see your ‘Conv. Value / Cost’ numbers inside your AdWords account. This column is calculated by diving total conversion value, which is the total revenue numbers you passed to Google for that data point (i.e ad, keyword, etc) by the cost of those same clicks. Conv. Value / cost = Total Conversion Value / Cost. Total value divided by total cost for all ad clicks that can be tracked to a conversion. If you’ve entered your revenue or profit value, this metric will be equivalent to your return on investment. Conversions are only counted on Google and some Google Network sites or products. This metric is adjusted to reflect only the cost of ad clicks that can be tracked to a conversion. Google states that this number is your return on investment (ROI). However, that’s not accurate as the formula that’s being used is the ROAS formula, not the ROI formula. Please note, most people show ROAS and ROI as percentages. Google shows it as a whole number. So a 2750% ROAS is displayed in AdWords as 27.5. These are the same number, only the display changes. ROAS and ROI are simple ratio metrics. It is possible for one ad to have a higher ROAS than another ad, but have less profits. In this example, ad 2 has a higher ROAS but less profits. Ad 1 has a lower ROAS and higher profits. It’s useful if you can to calculate profits along with ROAS for your campaigns. This is another reason that we like using revenue or profit per impression in our ad testing; and we’ll cover that metric soon. When you are going to say ROI or ROAS, think back to what math which you are using for the basis of that statement. Is it your actual ROAS, your ROI, or some version of ROAS you use inside your PPC department for bidding that might not be your actual ROAS? If your team has a 200% break-even ROAS, then you aren’t calculating ROAS. You might internally use the term ROAS as a way to describe your numbers, but this number is more akin to cost of revenue calculations (although, that’s not quite right either). We’re going to discuss how to test by ROAS and Revenue/Profit per impression metrics. These are two great metrics to use for ecommerce accounts. However, we needed to first define ROAS and its various permutations before we can easily discuss how to use ROAS and RPI/PPI for testing purposes.